The technique known as “guided reading” actually falls between the processes of “shared reading” and “independent reading”. Thus it’s an excellent “stepping stone” that can be used by teachers and parents. In schools, guided reading is usually conducted in small groups of no more than half-a-dozen youngsters, perhaps less based upon the ages of the learners. Each girl or boy spends approximately fifteen minutes (again, this is dependent upon the readers’ ages) reading an age-appropriate book or magazine to him or herself. The adult in the room is available to help with questions, but does not read the book for the child. Like a coach, the educator, mum, or dad provides encouragement and reminds the child of spelling and grammar rules; however, he or she must resist the temptation to simply read the entire text for the youngster. After all, the point of the exercise is to move a child from “shared” reading to “independent” reading. Guided reading helps boys and girls on a number of different levels, most notably the seven below. Children begin to look for “sight cues”. For instance, if a book is about a rabbit and the child is having difficulty with the word “carrot”, the teacher might help guide the child to decipher the term using pictures on the page as a guide. Guided reading provides good practice in reading from left to right. Of course, this isn’t the case in all languages, but for the purposes of this article, we’ll be focusing on English. 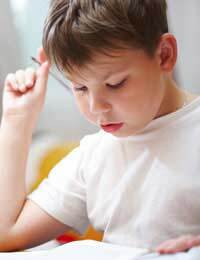 Many kids do not naturally have a tendency to read in this manner; consequently, guided reading can get them accustomed to doing so. Guided reading offers children the opportunity to begin to memorise and recognise common words. An example would be “the”, which is frequently used in English. Eventually, the child who is learning to read should get to the point when he or she isn’t “sounding out” many words that are familiar, but is merely reading them without pausing. The experience of guided reading can be helpful in understanding the concept of “sequencing.” Most tales have a beginning, middle, and ending; to adults, that’s completely expected. However, youngsters have to be taught this technique of storytelling. Guided reading can provide a fabulous opportunity for such sequential understanding to begin. Children are forced to deal with punctuation when they are involved in guided reading. They learn that exclamation points indicate excitement and that a period ends a sentence. Often, they are confused at first by commas, quotation marks, and even question marks, but with a teacher’s help, they can soon become familiar with such conventions of the English language. Guided reading gives children the chance to correct their own errors. Often, when kids make mistakes, adults quickly try to “fix” the problem. But the point of guided reading is for the coach (a.k.a. mum, dad, or instructor) to empower the youngster to self-correct. Finally, guided reading gives kids the practice and confidence needed to become literate. Without an opportunity to work on their own in a non-judgmental environment, they might not be able to achieve the goal of literacy as quickly. So the next time your child asks for you to read a book to him or her, you might want to say, “Why don’t you read it to yourself for a few minutes first?” That way, you’ll be providing support and showing your youngster that you believe in his or her abilities.